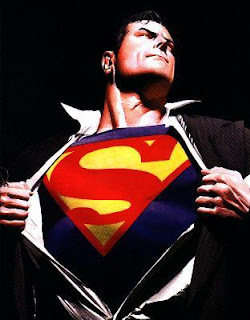 De Angelis Ark: Why does the world need the Superman? I'm a huge Superman fan. I was born in the 80s, but it was in the early 90s that my passion for Comic Books flourished. The first book I ever read was a reprint of a Superman adventure from the 40s or 50s, with Supergirl and Jimmy Olsen as support characters. And I fell in love with the Super Heroes world since then. If it is true that Action Comics #1 is the beginning of the comics Golden Age, I can say Superman is also the beginning of my personal golden age. About two years ago, while I was in Brazil, I stopped at a newsstand to do what I love to do: check on the novelties of the comics world. I bought some of them, just to have what to read on my way home. Being far from NYC, after living there for a while and not so sure if I would ever come back got me in a gloomy mood. Comics had always helped me in that aspect, offering me a refuge in the X-Mansion, the Batcave, or, in this case, the Fortress of Solitude. That was when something happened. Something simples, but with the effect of an 'Infinite Crisis' inside me. No, I didn't find out I was a mutant, if that's what you're wondering. Unfortunately, not that. A boy, one of those who sells candies in the buses to help their family, asked me to buy him a Comic Book. I smiled, and, of course I would buy that kid a Comic Book. I saw myself in that little one in that moment. "Which one do you want? ", I asked him, "Mickey? Donald Duck?". "No", he said, "Superman!". I asked the reason why he chose that one specifically and he simply said: "Because he's the best", his smile was spontaneous, "And he's always ready to save the world!". After buying him a few Comics, already on my way home, I caught myself thinking about how a hero, over 75 years old, still have this power of attraction to the new generations. I realized then that, even outside of the Comic Books, the world needed a Superman. Think about it! Have you ever wondered the world could be a better place if the super heroes really existed? In fact, most of us at a point in our lives imagined ourselves holding super powers and how great we could be. I imagined what my powers would be and sometimes drew my own uniforms, with underwear over the pants (Literally speaking, unfortunately), and I had my allies and missions. Most of them happened in the school. It was my reality escape and many of my friends felt the same. We had a club! A club for us to talk about our missions, the "villains" in our neighborhood, read Comics and watch cartoons. We would spend hours talking about heroes and their nemesis, super powers, scientific ways to achieve those powers... We would buy trading cards and go to special events... And then, as we grew up, we abandoned the missions. We became adults and cynical about certain subjects. It is weird for me to still use Comic Books as my escape, but I do. And people who know me got used to it. As a matter of fact, the world needs a Superman. As it needs Batman, X-Men, The Avengers, Justice League, or any other character that can make us believe in the power of dreams. That can make us believe there's still someone, somewhere, fighting for peace, justice, and, most importantly, for us! I know a lot of you who still read Comics, or you who has just begun to, you are all going to understand we need the heroes. We know we have to be thankful for them, because they made, and still make, our worlds better places. I wonder where I would be without their "help". That's why I know the world still needs a Superman. And it will need him for years to come.